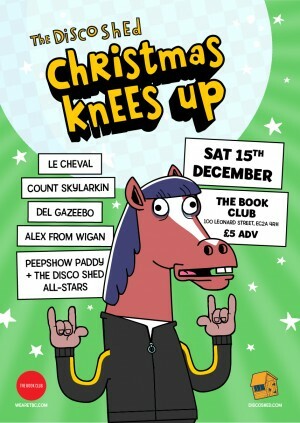 The Disco Shed massive return for an Xmas special, as well as the usual crew of Gnombs and Shedonists, they are welcoming eccentric party starter Le Cheval for an almighty festive knees-up! This Xmas Boogie Addict – Le Cheval, heads up an all-star cast of Shedonists underneath the mistletoe – expect a mix of all killer, no filler shedonism with the likes of Del Gazebo, Count Skylarkin, Peepshow Paddy and more of the Disco Shed All Stars Stepping up to the 1’2 & 2’s. Expect everything from dancehall to rockabilly, disco to do-wop, club classics to hip hop from a host of the regular sheders who rocked our allotments at Latitude, Bestival, Common People and all the rest over the years. Expect it to get messy!